Humaria Officinalis. It is a beautiful little weed. 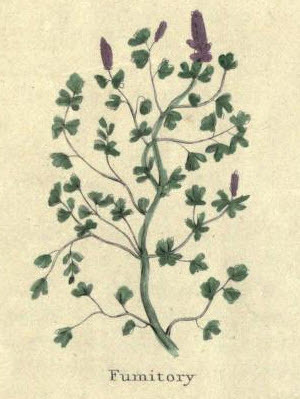 It shoots forth from one square, slender weak stalk, and leaning downwards on all sides, many branches two or three feet long, with finely cut and jagged leaves of whitish, or rather bluish sea green colour; at the tops of the branches stand many small flowers, in a long spike one above another, made like little birds of a reddish purple colour, with whitish bellies, after which come small round husks containing small black seeds. The root is yellow, small, and not very long. It over�spreads the English corn-fields; and it flowers in May. The ancient physicians regarded it as possessing considerable virtues. The expressed juice is excellent against scurvy. It opens obstructions of all the viscera, and is good against the jaundice, and all diseases proceeding from obtsructions. Dr. Cullen says, " This plant is a tonic. I have found it useful in many cases in which bitters are prescribed; but its remarkable virtues are those of clearing the skin of many disorders. I have seen its good effects in many instances of cutaneous affections of the worst character, which I deemed to be lepra. I have commonly given the expressed juice, two ounces twice a day; but the virtues remain in the dried plant; so that they may be extracted by infusion or decoction in water. It is best to combine it with other aperient herbs, for it is not strong enough of itself, and either in syrup, or decoction, it will improve the liver, remove jaundice, and clear the blood, and strengthen all the inward parts. The seed is stronger than the leaves. The juice dropped into the eyes, clears the sight, removes inflammation, and redness, though it is rather painful at the first. The juice of Fumitory and Docks, mixed with vinegar, makes an excellent wash for the cure of scabs, pimples, blotches, etcetera. on the skin.